Does the moon affect the Jet Stream ? Evidence is presented showing that lunar tides do have a significant influence on the strength and position of the polar Jet Stream. The Jet Stream drives northern latitude weather patterns especially during winter months. I was intrigued by a proposal made by an Italian meteorologist Roberto Madrigali that varying tidal forces during the lunar cycle change the position of meanders (Rosby waves) in the polar Jet Stream. He has also written a book on the subject. This winter saw stormy but mild weather in the UK with exceptionally cold weather over North America. Both were likely caused by large distortions in the Jet Stream. Does the moon’s ever-changing tidal force affect Rosby gravity waves in the polar Jet Stream? The hypothesis, put simply, is that atmospheric tides acting just below the stratosphere affect the flow of Jet Streams. Increased tidal forces pull the Jet Stream to lower latitudes thereby inducing the mixing of polar air with tropical air. The result of such forcing is an increase in waves and oscillations in the Jet Stream and lower pressure differences. One indicator of how contorted the Jet Stream becomes is the measurement of the difference in pressure between the Icelandic Low and the Azores High. 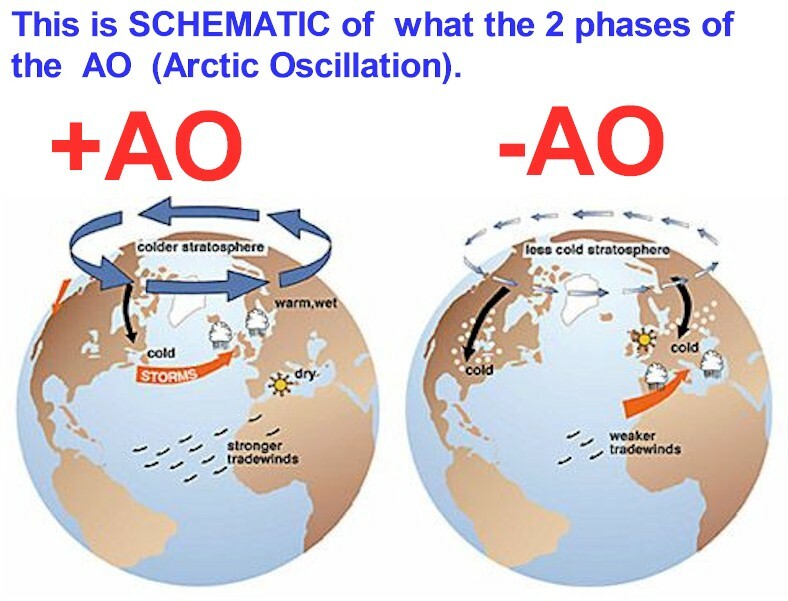 There are two indices used to do this–one called the Arctic Oscillation (AO), which treats the flow over the entire Northern Hemisphere, and another called the North Atlantic Oscillation (NAO), which covers just the North Atlantic. The two are closely related. When these indices are strongly negative, the pressure difference between the Icelandic Low and the Azores High is low. This results in a weaker Jet Stream with large, meandering loops, allowing cold air to spill far from the Arctic into the mid-latitudes. 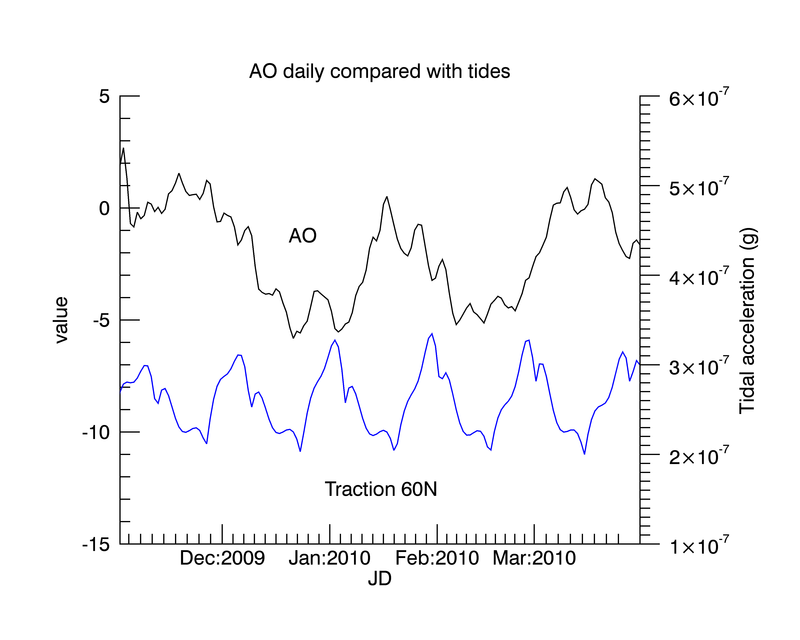 Severe UK winters such as those in 2009/2010 and 2010/2011 coincided with strong negative values of AO/NAO , whereas the mild but stormy winter of 2013/14 coincided with strong positive values of AO/NAO. The Jet Stream influence on Europe is stronger during the winter. This is also the time when solar heating of the atmosphere is diminished over the Arctic, so any possible lunar tidal effect will be enhanced. To investigate further the hypothesis of a lunar influence on the Jet Stream I downloaded the data from NOAA and calculated the net tides for each day from 2000 until 2014 using the JPL ephemeris. I am basing these calculations on the formulae derived in Understanding Tides. Figure 1 shows the AO and NOA during the interval plotted together with the net solar/lunar tidal acceleration. 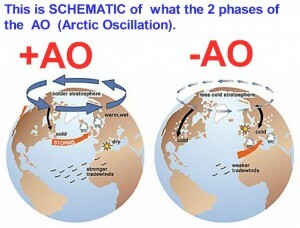 Arctic Osclilation (AO) and North Atlantic Oscilation (NAO) indices. Shown in Blue is the net lunar-solar tidal acceleration from 2001 until 2014. It is seen that in general the AO and NAO agree with each other so we simply now concentrate on the AO data. The period of oscillation of both is indeed similar to the monthly change in lunar tides, but no obvious cause and effect stands out at this level. We now look in more detail at two years of data: 2003-2004. Intriguingly the oscillation period of the Jet Stream is also around one month. However there is only a small 3% anti-correlation between net tidal forces and AO. 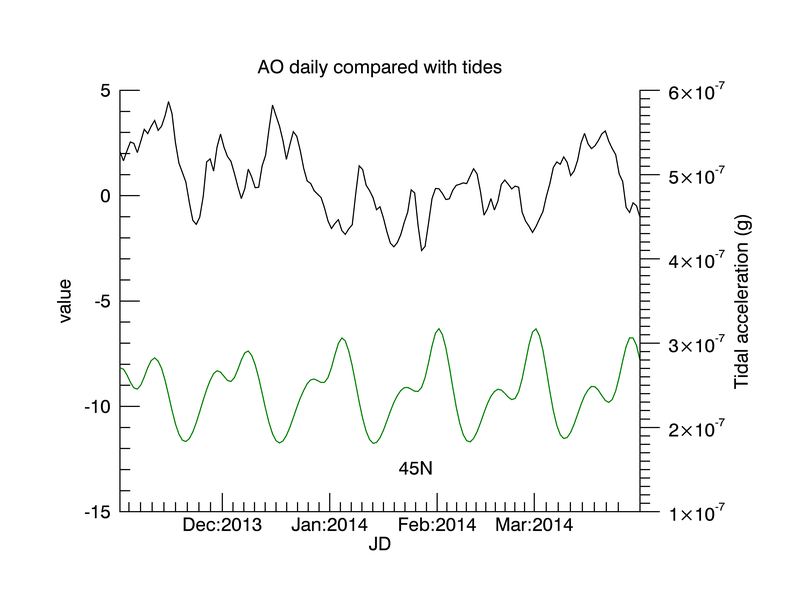 This gives just a hint of a tendency that when tidal forces are large the AO tends to go negative. The largest apparent “atmospheric tides” are those due to solar diurnal expansion. These are not gravitational tides. During northern winters such “solar heating” is diminished over the Arctic. Winters are the period when lunar gravitational tides could be expected to play more of a role in the positioning and strength of the Jet Stream, if such an effect exists at all. I therefore decided to look more closely into the latitude dependence of the lunar tidal forces and in particular at the horizontal component of the tide or traction. It is this component which can move water and air long distances during the tidal cycle. Its strength varies during the lunar month and during the 18.6 year precession cycle. I calculated the tractional force/unit mass or acceleration for 60N and 30N which covers the range in latitudes typical of the Jet Stream. AO compared to the tractional component of tides for latitudes 60°N and 30°N. Note how the range of forces varies with the changing moon declination after the maximum in 2007. What is particularly interesting here is the dependence of the tidal force on the 18.6 year precession cycle of the lunar orbit. The maximum standstill of the moon was around 2006-2007 when the declination angle reached a maximum of 28.6°. Since then it has been declining and is currently around its minimum value of 19.5°. A high declination angle actually reduces the tractional force most evident in the 30°N value shown in green above. There have been several papers reporting a link between the 18.6 year cycle and droughts across the US and central Asia. If the moon really is affecting the Jet Stream then this could be the explanation. Now we look in detail at two winter periods. Firstly the harsh winter for the UK in 2009/2010 which corresponded to low values of AO. Is there any evidence for a lunar tidal effect on the Jet Stream in winter ? Winter 2010. Clear causal relationship between tidal traction 60N and the AO. I find this result remarkable. It shows clear evidence of a relationship between the strength of the lunar tidal force and the positioning and strength of the Jet Stream. There is an underlying anti-correlation showing a reduction in AO with tractional force at 60N even matching some details. There must also be a stochastic component so the agreement cannot be expected to be exact. Finally we look at last winter 2013/14 which saw the Jet Stream meander further south bringing storms to the UK. Since the meanders of the Jet Stream reached down to lower latitudes, I calculated the tractional forces for 45N. The results are shown below. Again there is clear evidence that high latitude lunar tides modulated the Jet Stream. The severe storms in the UK caused coastal flooding because they coincided with high spring tides. Now I suspect that probably those high spring tides may have also have been a major cause of these very storms by also perturbing the Jet Stream! This entry was posted in Climate Change, climate science, Physics, Science and tagged Tides. Bookmark the permalink. 7 Responses to Does the moon affect the Jet Stream ? Did I read that right? R = -0.03? 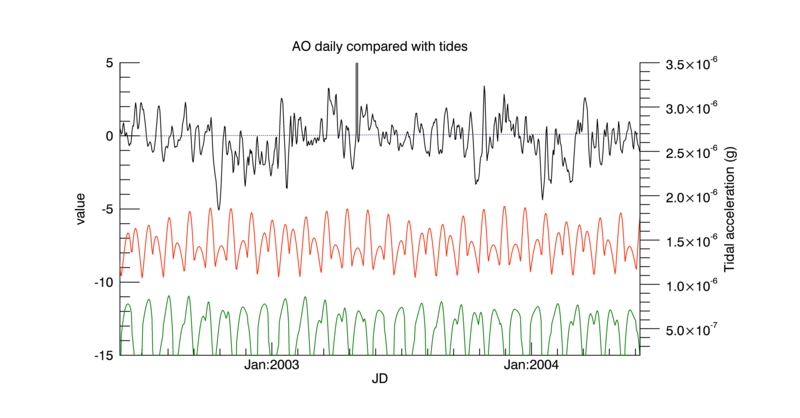 If you take every day from 1950 to 2014 to compare global tides with AO and then run it through the IDL procedure ‘correlate’ the answer is just -0.03, but – it is still statistically non zero. However it is just the winter months that show clear correlation with the horizontal component of lunar tides at jet stream latitudes. I am currently driving through France so my reply is a bit cryptic I am afraid. I realise now that the correlation I quoted is wrong. The two time series need to be normalised first. I will re-do the calculation and see what the result is. How are PNA and NAP related to the NAO? Typos? Sorry Clive, I do not see a correlation between AO and your tide data. NAP is a typo and should of course be NAO. I met Roberto Madrigali while I was in Italy and he is convinced that changes in atmospheric tides tweak the Jet Stream causing it to meander and mix cold and warm air. Now I am back I intend to look at this in more detail. For over 20 years there have been reports of 18.6 year lunar cycles in droughts from China to the US. The tractional forces of spring tides changes significantly with latitude during the 18.6 year precession cycle. Clearly it is not a simple cause and effect type phenomena if it exists at all. There is clearly also a chaotic component which may be dominant. Isn’t it true that arctic air mass, being dense, would be subject to lunar gravitational pull in the winter when the Moon is closest to Earth? If so, then the shifting of that air mass would also shift the jet stream for a short period of time.